Gerrit Crafford passes Gert James for second position, at the start of Race 1. Gabriel Rossouw leads. 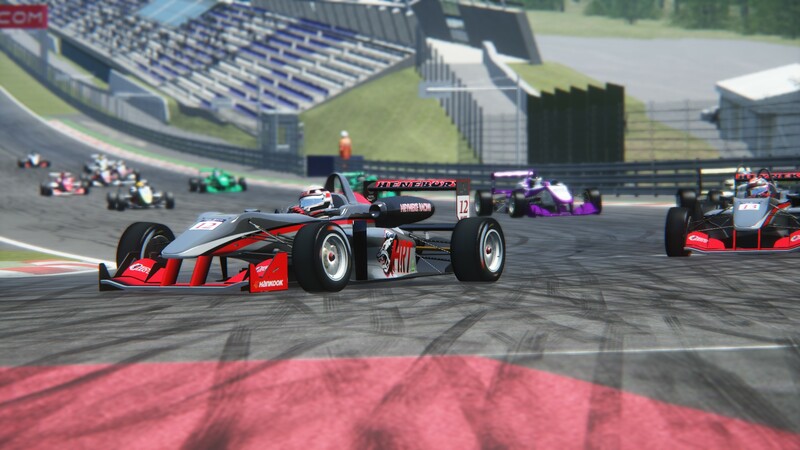 Both AGBS drivers, Gert James and Gabriel Rossouw, took victories of the SA simF3 Round at the Spielberg circuit, however a significant top speed deficit to Zero Point Racing’s Gerrit Crafford and H-J eSports Jason Holden-Jones made for a good challenge to the dominant AGBS team. H-J eSports Jason Holden-Jones led Race 1 at the half way point. After an impressive qualifying performance, Crafford immediately revealed his top speed advantage by first passing James on lap 1 and then moving to the race lead by passing Gabriel Rossouw on lap 2, both moves executed on the long run to Remus corner (turn 2). Holden-Jones, after getting by James, inherited the lead of the race when Rossouw tagged the gearbox of Crafford through the fast sweeping Red Bull Mobile corner. The way in which the cars were different set-up wise produced a thrilling dynamic battle between Holden-Jones and James for the race win, both showing significantly different strengths and weaknesses around the track. With seven laps remaining, James eventually found a way passed Holden-Jones under braking for Remus. The move coming at the part of the track that suited Holden-Jones the most, this let James open up enough of a buffer before the same part of the track again on the next lap. Rossouw and Crafford recovered to third and fourth before race end. HRTs Mark Henebury finished both races in fifth position. The start to the second race saw Crafford and James into the wall at Remus, this allowed pole starter Rossouw to comfortably maintain the lead of the race throughout the opening stages. James displayed an impressive recovery drive to see him move up from 10th overall to 4th by race end. Rossouw won the race by 21 seconds ahead of Holden-Jones. In the F3-AM class, Crafford scored a double victory. Rossouw has added just two points to his slender Drivers’ Championship lead now six points ahead of James and Holden-Jones. 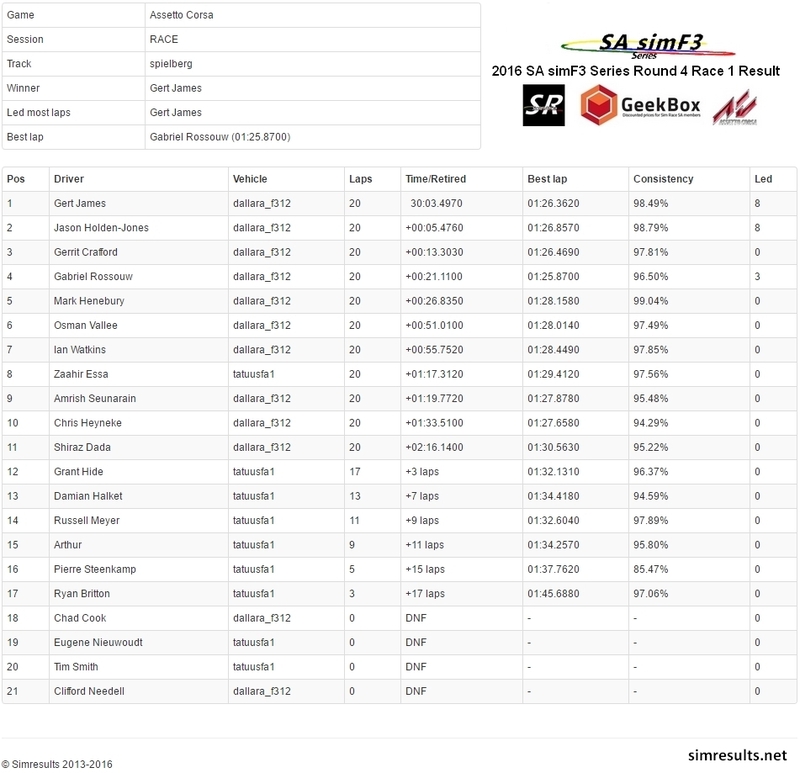 AGBS continue to lead the Teams’ Championship by 26 points ahead of The real McCoy DP, and 43 points ahead of HRT. The real McCoy DPs Clifford Needell leads the F3-AM Drivers’ Championship ahead of Crafford and teammate Ian Watkins. 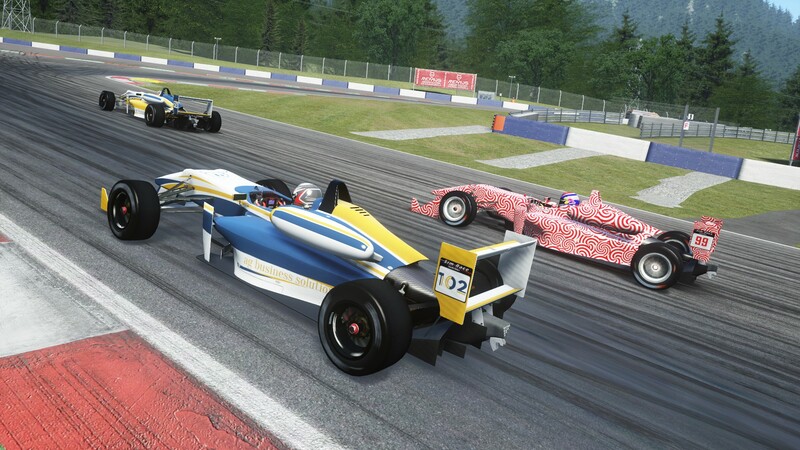 The next round of the championship will be at Norisring (track still to be confirmed) on 04 July 2016, and will be available for viewing on Sim Race South Africa’s Youtube channel from Friday 08 July 2016 , subscribe here. 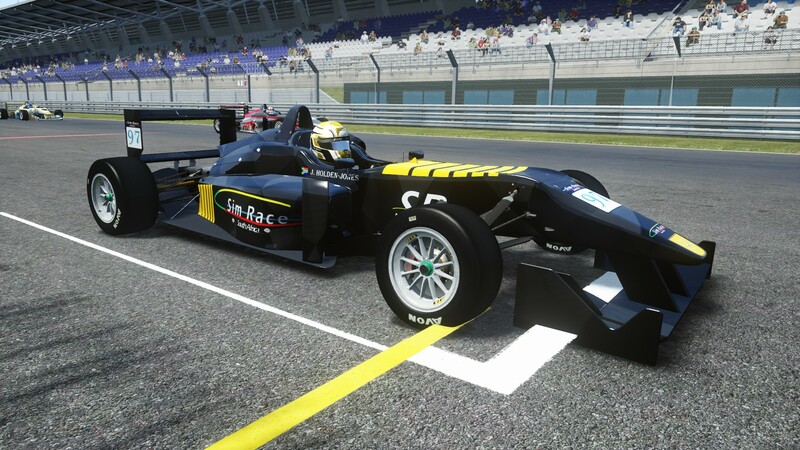 New sim racers are very welcome to join the championship.